Do I smell hot dogs?!" I haven't written about our nose work classes in a while. Yes, we still go on Monday nights. This week we introduced the dogs to vehicle searches. That was pretty intense. By the way, next time I see that friend who said "Try nose work. It's easy. The dog does all the work." I'm going to stomp on her food. Hard. There is a lot to think about on my end -- wind, search patterns, leash handling, body language, space, time, NO PEEING (Jedi), no vomiting (me) -- it's enough to give me a headache (or a panic attack). Truth be told, I don't know if Jedi and I will ever actually compete in nose work trials. * Right now we're just having fun in class. Jedi doesn't care if we ever get a ribbon or a title. He just likes finding things and then getting hot dog pieces as a reward. However, if we do decide to compete, we'll have to pass an Odor Recognition Test first. A wha . . . .? This is what my "Find the Odor" instructor sent out about ORTs (Odor Recognition Tests). It was so good that I'm reposting here word for word for all my blogging buddies to enjoy. So would that make this a guest post of sorts? Anyway, I hope you enjoy it. An ORT “Pass” is good for the life of the dog. The dog only has to pass it once. 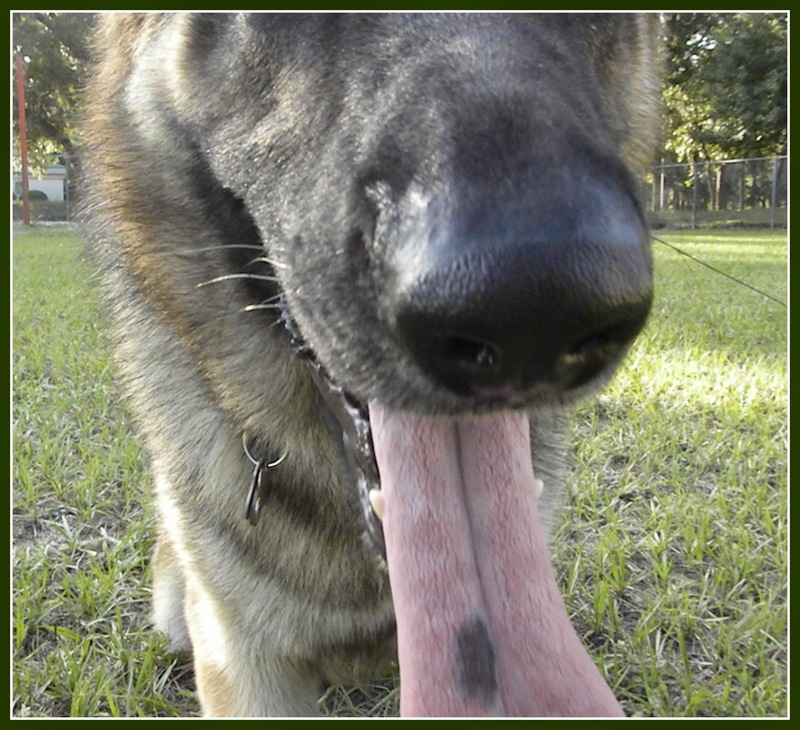 The purpose of the ORT is to verify the dogs know the target odor (scent) used in competition. To pass, the dog must identify the location of the target odor and the handler must correctly call an ‘alert’ (or equivalent) within a three-minute time period. The odor will be hidden in one of 12 identical closed cardboard boxes. The boxes will be set up in a pattern of 1 or 2 rows with a minimum distance of 4 feet from box edge to box edge. The ORT ends when you call “Alert” or you run out of time. Your dog does not need to, in fact will not be allowed to, check the rest of the boxes. You have 10 seconds to orient your dog before crossing the start line. Once your dog’s nose (or any other part of his body) crosses the start line, the clock starts whether you realize it or not. The timer will NOT tell you he has started the clock. Therefore, keep your dog at least 2 feet back from the start line while letting her orient. Depending on air movement, many dogs will pick up the general direction of the odor if allowed to orient first. Watch your dog for signs he is interested in a particular direction. If your dog immediately proceeds in a direction, follow him rather than force him to go in a pattern of your choosing. If your dog doesn’t find the odor by going straight to it, or your dog doesn’t seem to be interested in a particular direction, THEN you ask your dog to search a pattern you suggest. Use your voice! Do not use the leash to force the dog into your pattern. It’s there to prevent the dog from going too far out of the search area, helping you encourage him into a pattern. Keep track of which boxes the dog has checked and which he has missed. If your dog fails to indicate a box at the end of the pattern, encourage him to go back and check the ones he missed. Check both sides of the boxes. If you take the dog along the inside of the line(s) of boxes and he hasn’t found anything, go around again with the dog on the outside of the line(s). At any point, if your dog suddenly turns and heads with determination or strong interest in a particular direction, abandon the pattern and let him go there. He has most likely caught the odor and is trying to follow it to source. Watch for your dog to “catalog” – identify the source of the odor but decide to check the rest of the boxes. When cataloging, the dog shows interest in a box but does not commit to it. If your dog then checks the other boxes but doesn’t find anything, start the pattern again and make sure he re-checks that box. If he was indeed cataloging, he will most likely commit to that box on the second time round. Hey, it's Thoughtless Thursday. And as usual, I'm thinking too much! Why not click around below and see what some of my favorite blogging buddies are thinking about today?